A 16th-century metrical psalter produced by Thomas Wood, held by the University of Edinburgh. My heart, my hope, my plaint, my overthrow. . . . The Scottish Gaelic Psalter was produced by the Synod of Argyll. 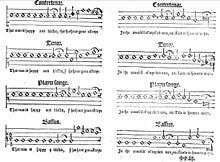 By 1658, the first fifty psalms had been translated into ballad metre due to the work of Dugald Campbell, John Stewart and Alexander McLaine. A manuscript of the final 100 psalms was produced in 1691 with the entire Gaelic psalter, with revisions to the 'first fifty' being produced in 1694. The Gaelic Metrical Psalms are used to this day in the Scottish Highland Presbyterian Churches where the practice of lining out is used, in accordance with the Westminster Assembly of Divines Directory for Public Worship. The corpus of tunes has shrunk over the years with only about twenty-four in general use. 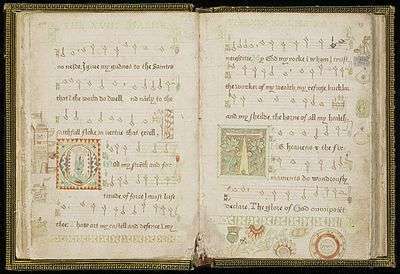 A split-leaf psalter (sometimes known as a "Dutch door" psalter) is a book of Psalms in metrical form, in which each page is cut in half at the middle, so that the top half of the pages can be turned separately from the bottom half. The top half usually contains the tunes, whereas the bottom half contains the words. 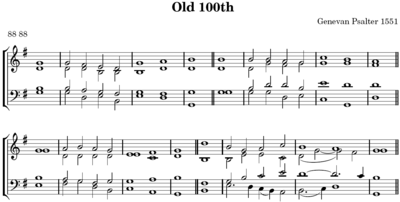 The tune and words can be matched by matching the meter; each meter is a specification of line length and (implicitly) stressed syllables; if a tune is in Common Meter, any set of "Common Meter" words will go with it (and vice versa).